A note from Richard Lindzen on statistically significant warming | Watts Up With That? Download the latest 312-50 questions for practice and pass your 642-611 and 70-450 exam on first attempt. Excellent point by the Prof. – the 1998 “spike” is irrelevant because it was immediately followed by an equivalent cooling. It is of no significance what so ever. If you look at the RSS/UAH graphs from the start to today. The actual statisticaly measured warming over the whole period is something like 0.1-0.2 of a degree from 1979 to today. 0.1 of a degree warming over 20 years when CO2’s influence should be the STRONGEST !! Remember that CO2’s heat effect is logarithmic. The more you add, the less it`s impact. Most of the the evil warmening doom should have already been happening. Posh. Who heard of such nonsense. Lindzen evidently reads Watts Up With That? and The Reference Frame (he referenced Lubos’s “Global Warming: The 1958 Edition” recently. I wonder, what else does he read? The difficult concept that global temperature is not increasing gathers steam; thank you Dr. Lindzen. Another difficult concept, that of solar dominance of Earth’s climate, (in the absence of unusual stellar events) may also gain some momentum soon. Maybe not. But if so, at what cost? That looks like annualized data, which greatly attentuates the effect of the 98 El Nino. I like the graphic though. I wish I knew what software was used to produce it (and the fuzz). Magnetic influence of the Sun seems obvious (based on history); I cannot imagine a hominid rejecting it (let alone PhDs). The exact mechanism will be found by the survivors; or maybe it has already been found and ignored. I am somewhat concerned with stocking the root cellar at the moment! On the other hand, maybe cycle 24 will start this month as guaranteed by AGW share owners. What are the odds, though. plunked the whole works into Excel, added 14 Deg C to to the JD anomalies. I then took the period 1917 (13.61 deg C) to 1944 (14.21 Deg C) for a global warming of 0.60 Deg. I did the same thing for 1978 (the 1st time the temperature remained above 14 Deg C and after the “cooling” – 14.01 Deg C) to 2005 (14.62 Deg C) for a global warming of 0.61 deg C. Both periods are 27 years. A 0.01 deg difference. Am I missing something here? We seemed to survive the great global warming of 1917 to 1944. I seems a good bet we will survive this one too. I am beginning to doubt it has anything to do with CO2. She is trying to do some pretty rigourous statistical analysis to determine whether the actual temperature trend is consistent with the IPCC predictions. This is the first time that I have seen someone take autocorrelation into account (temperature is not white noise since future values are correlated with past values). The results are surprising. Just saw a weird sunspot when I enlarged the sunspot link at the top of the page… wait… no just a fly… sorry. Nice to see that someone of Prof Lindzen’s stature is reading your blogs. “It is also likely that, in the Northern Hemisphere, the 1990s was the warmest decade and 1998 the warmest year” without mentionning it was due to el Nino. I wonder why an absence of warming or even a rapid cooling is due to natural variability but a warming IS manmande. Call me ‘Alarmist’, but I still see a rising trend. We are speaking about only a 13 year period here. I’m not sure I’m ready to call this a trend. But, the CO2 theory predicted accelerated temperature rises, and that we are not seeing right now. Problem here is, despite that you may be *technically* correct that there is no statistical warming the last 12 years, put that graph in front of 100 people and at least 99 of them will see a clear warming trend. Warming trend from when to when? Depends on your starting point doesn’t it? is defeated by refering to the warmers’ own claim that the CO2 effect is being masked by dimming, as they would state. Response: OK So you admit the Sun affects the climate more than CO2. Also, once again they cherry pick. When the TSI was increasing, they poo-pooed it’s effect as negligable; now if it’s decreasing (?) the effect is suddenly important? Robert Wood, Don’t worry the cooling will next be caused by China and all of their coal burning (sulfur aerosols) power plants. Calculating a highly significant trend from the data Dickie here present can be carried out wiht math of a seventh-grader. It is a little thing called math. Anyone of you heard of that? 0.2 of a degree is not statistically significant. Just because someone sees a visual upward trend doesn not mean that it’s “significant” statistically. 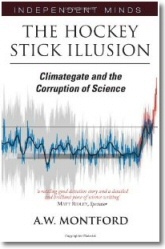 The hockey stick had to be massaged enormously to make it appear cataclysmic (what log was it calculated against? 10? 20??) on a standard graph it falls well below the threshold of statistical significance. The focus has to be on what drives climatic change. We ought not be reduced to cheering or booing whenever the global temperature moves a tick or two in one direction or the other every month. This all seems to have evolved into a some sort of spectator sport. But I guess I can understand a scientist’s impatience in waiting to see whether or not unfolding events will confirm his theory. The more one looks at data, and thinks about it, the more it appears CO2 has only a minor forcing effect. Yes, but the UN and Gore will claim it is mainly due to auto exhaust (not 3rd world factories), thus providing the basis for going after the US car driver. It is not that simple. 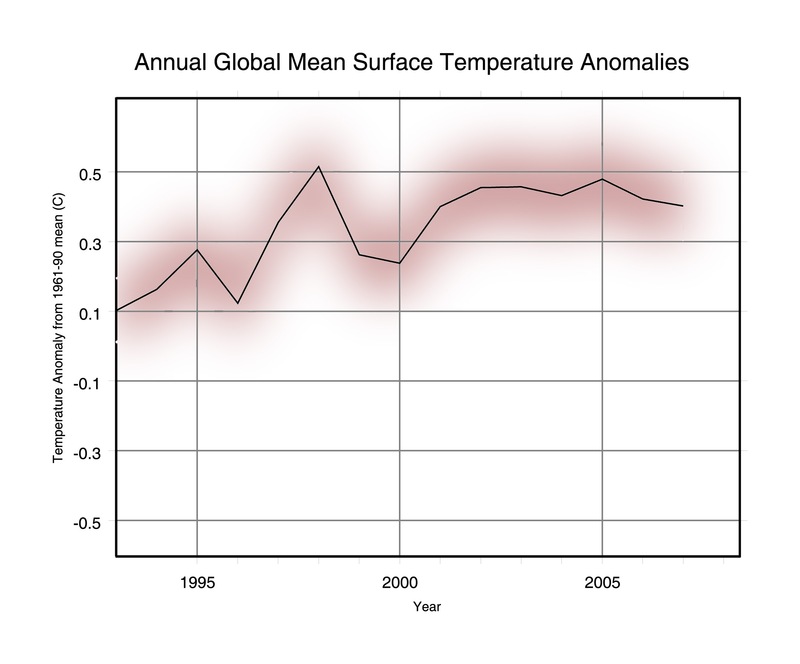 Proper trendlines for temperatures must take autocorrelation into account. This will result in wider error bars. See the link to Lucia’s blog if you want more information. Global Warming is Real and we are all going to die unless Global Big Government takes over control of all energy consumption. I know it’s true because I saw it on TV. Only Deniers who have been bribed by Big Evil Business disagree. With all them True Believers seemingly believing in their consensus-backed, scíence-is-settled, super computer-modelled catastrophic climate scenarios, I was surely thinking I could make a fortune taking them to the climate cleaners. So imagine my utter disappointemt when I found out they weren’t willing to bet on anything more than non-catastrophic, very mild climate changes. In fact, many would be afraid to even bet on a positive SLR, let alone 50 cm. Talk about confidence and certainty. My understanding is wider error bars means that any trend is *less* significant. * If we assume AGW is true, the trend is 2 c/Century (or whatever you like), then wider error bars mean that we need more data to disprove this assumption. Failing to disprove doesn’t mean it’s proven. It just means Lee believed it all along, and s/he’s not going to stop believe that until it’s disproven. * If we assume “no trend” is true, then wider error bars means we need more data to disprove that assumption. Failing to disprove doesn’t mean we’ve proven “no trend”. It just means Raven believed “no trend” all along and s/he’s not going to stop believing that until it’s disproven. Each person will certainly continue to believe what they always believed until whatever amount of warming s/he believes in falls outside the error bars. So, big error bars means more uncertainty. Weather is going to continue to happen. So… we’ll wait and see what the rest of the year brings. Lee, from what years are you using for your trend line? Lindzen is saying that it is statistically flat from 1997 to present, but the graph starts BEFORE that. Just eyeballing the graph, it looks like from just those years the trendline would be flat or pretty close. Will someone please tell me what I’m missing? I see .3 as being within the error bars for EVERY year listed. So where does the “trend” come from? From this information, it’s entirely possible that every single second in the 12 years shown, has seen the same global average temperature. Do we just assume that every year is in the middle of the bars? If that’s the case, why have them? While it’s possible those bars are overly pessimistic, we’re talking about this specific graph. If you think it’s incorrect, that’s a different discussion. Are you saying that some particular regression line (with a positive slope) shows 99.5% of the variability of this graph? Or are you saying that of all possible regression lines, 99.5% of them would be have positive slopes? The former is the impression I get from your statement, and that doesn’t fit what I’m looking at. A resource page is a great idea. The tricky thing about finding a good stats resource is that the sorts of climate science issues that are popular on blog discussions involve a mix of basic and more advanced concepts. A good resource would pick out some of the necessary concepts and – here’s the important part, in my mind – take a couple of paragraphs to apply them to a climate example or two. For instance, up-post a bit people were discussing error bar sizes. If you read a stats book, you’ll encounter this concept pretty quickly under “the sampling distribution of the mean,” or similar terms. For stats novices, I’ll bet that the significance of sample size to this distribution will pass unnoticed, without a specific pointer to where it applies to climate. 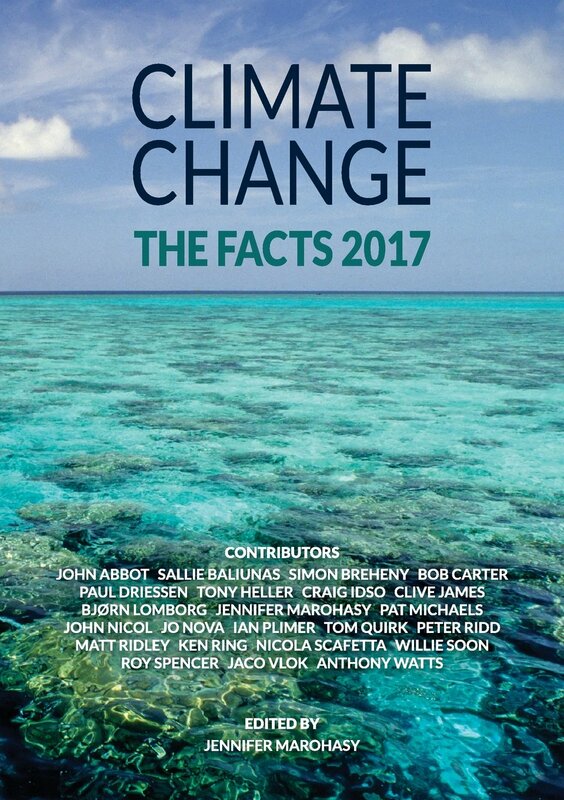 Anthony, here’s an idea fwiw: what about a wiki-like resource, that various people could write and edit, tailored to introduce stats concepts, as applied to climate science? That way various knowledgeable people could contribute bit by bit when they have time. Of course, you’d have to administer it, and I’m sure you have enough to do… ; ) Does this make sense to anybody else? Consider a value represented by 0.0 +/- 0.3. This doesn’t mean than that it’s equally likely that this value will be between -0.3 and +0.3. It’s usually means that the best guess at this value is 0.0, but the probability of the actual value is characterized by the normal distribution. This basically means that it’s more likely that the value lies close to the best guess value, and less likely that it’s further away. This plot shows made up data that has a linear trend of 0.2 somethings per somethings else, and some Gaussian error. The error associated with each point is 0.2 somethings. Hopefully it’s clear that there is a statistically significant trend. It should also be clear that by taking a subset of the data, you’re likely to get a value not equal to the prescribed trend. For those of you who haven’t done real measurements it’s not ok to just assume confidence intervals or assume a Gaussian shape just because you did a certain amount of measurements. In the real world outside of climate science, you actually have to demonstrate that the amount of data collected was sufficient to give a Gaussian distribution – typically by plotting the data. Only after demonstrating a Gaussian have you demonstrated that the data collected was sufficient to allow you to eliminate skews and bias and hence assign confidence intervals. If no Gaussian is obtained then there is really no such thing as a confidence interval. Of course I’d dearly like to see those Gaussian plots of global temperature anomaly but they apparently don’t exist which means that any error bars you see in temperature plots are bogus. Now that IS stats 101 and I see everyone failing it. Histogram of monthly temperature anomalies at Tucson, AZ. The red curve is the normal distribution based upon the mean and standard deviation of the anomalies, and is not a fit. Nobody is failing stat101; we already know the temperature anomaly data is normally distributed. REPLY: Hi Atmoz, can you cite a location/url for source data? Not trying to dispute anything here, just always like to have more data soruces if I don’t already have it. The data is from the USHCN. I believe it’s from http://www1.ncdc.noaa.gov/pub/data/ushcn/ . It’s their mean max monthly (filnet) product, although other temperature data will look very similar. In hindsight, I definitely should have included the words “statistically significant” when I asked where the trend was. My only real objective was to get Lee to show us how he derived a .99 correlation. (Incidentally, I hit the wrong button on my calculator. Where I wrote 99.5% above, that should have been 98%) What I was attempting to point out is that every year is within the margin of error of every other year. For statistical significance, particularly over such a limited data set, the trend needs to far exceed the margin of error, as it does in the example you pointed me to. In this case, while unlikely, a flat line can be drawn within all of the confidence intervals. Also, I have serious doubts that these confidence intervals represent Gaussian distributions. If they were truly Gaussian, each confidence interval would be different, varying with the number and quality of data points used. As the number of stations is dropping precipitously, but the error bars aren’t increasing, that’s clearly not the case. My best guess (and that’s all it is) is that they calculate a pure average, without running an error margin through the algorithms. They then apply a predetermined confidence interval, derived from little more than dead reckoning. Their “95% confidence interval” is probably no more mathematically valid than the “very likely” term the IPCC applies after taking a vote. As I don’t know the specific methods used in determining the size of these specific error bars, I’d welcome any explanation that anyone could provide. Pingback: I need a little help « Watts Up With That? Well, since it is “next 100 years” (and who of us is going to be around then? ), there may be some scientists that “step up to the table” and place their bets (as long as no cash deposits are required). But “4+ cm in next 10 years”? Even with the major multidecadal swings that have been occurring since the records started, there will be no “scientists” ready to take that bet. That way you’ve got folks really scared without having to worry about anyone exposing your statement as a lie. But, then again, he’s a politician and not a scientist, so he is more skilled at this. It is well known that a “Super Volcano” lies under Yellowstone park. This volcano went undetected for many years, because its sheer size is so large it escaped notice when looking for something more familiar in size. The consequences of another eruption of this monster can be fairly well predicted. First, it will simply blow away a fair-sized piece of Montana, and falling ash will bury cities for many miles beyond. The atmospheric ejecta will blanket a large portion of the earth, blocking out the sun and producing a “nuclear winter” for a significant portion of mankind. Crop failures and other effects of rapid cooling will lead to the death of untold billions of both human and animal inhabitants. In fact, there are some significant geothermal and other indicators in Yellowstone that suggest this monster is again on the move. This has sparked at least one major television presentation discussing the potential for another eruption and the obvious catastrophe that would follow if it does. But this information in itself has not created much in the way of panic. Most citizens are resigned to the fact that mega-disasters, should they occur, can not be prevented by human action because they are part of the natural behavior of the planet and worrying excessively can not change anything. Don’t worry, be happy, we’re all in this together. Professor Wilfred Brimstone at the University of Mongolia has developed a model which clearly shows the buildup of human population on both the east and west coast of the United States is putting excessive pressure on both sides of the North American plate. The accumulation of vast amounts of additional weight in the form of people, buildings, automobiles, and other man-made items is creating such an excess of plate pressure at the edges, that magma is being forced laterally toward the center of the country, and in particular towards a weak crust zone in Montana centered at Yellowstone park. In the same manner as popping a pimple by squeezing from two opposing sides, the “coastal weight effect” is squeezing the magma beneath the crust and causing a rapid pressure buildup of the Yellowstone Super Volcano. Man’s greed to live near the ocean has tipped the balance of nature, and it is now only a matter of time until Yellowstone blows its top. ….. unless we take quick action to arrest and reverse this process. It is critically important to immediately evacuate everyone from both coasts, and dismantle all heavy structures and begin transporting them to the center of the country, redistributing them evenly over a wide area until the overall plate pressure has been suitably equalized and the danger has passed. Senator Barbara Boxer has introduced a bill which will impose a stiff tax on any item weighing more than six ounces in order to pay for the weight relocation. A new $100 million Center for Building Weight Studies is currently under construction in Santa Barbara. If you do not want to be dislocated from your present home, former Vice President Al Gore has just formed a new company, Relocation Unlimited, in which you can invest in “weight offsets” and not have to move. For a price, Mr. Gore will arrange have an equivalent weight of ordinary dirt dug up and relocated instead of your own 3 bedroom ranch. It is also of immediate importance that we educate our children in the nature of this pending disaster that their parents’ over-building has created. Children everywhere should quickly make costumes that resemble blocks of concrete and conduct ritualistic marches in the general direction of the central Midwest. This, combined with the waving of signs and the singing of Kumbaya will quickly spread the word throughout the public school system and draw the attention of the mainstream media which is also critical to this effort. Working together, we can all stem this rapidly looming disaster. incidentally, you can purchase your STOP YELLOWSTONE NOW t-shirts by visiting our online store, and our book by the same name is available on Amazon.com. A prime time television special is currently in production. Although i’m against polluting the earth, I don’t think i’ll be giving up my high displacement american v8 anytime soon. Pingback: Too much Politics... We haven't had a good AGW Discussion in quite a while.... - XDTalk Forums - Your HS2000/SA-XD Information Source! Pingback: Truly inconvenient truths about climate change being ignored: IPCC’s Pachauri says “warming is taking place at a much faster rate” « Watts Up With That? Pingback: James Hansen’s Former Boss Takes Him To Task Over Climahysteria » Pirate’s Cove — Shiny! Forget the science, when a bit of hand-waving and a tricky graph can do so much more. “No statistically significant rise since 1995” eh? But then isn’t that ALREADY statistically significantly higher than the reference period? And isn’t the trend upwards since then? So why the need to be a cheerleader for the intellectually bankrupt? Good luck with your next website. Reply: Keep digging, there’s gold in them thar posts ~ charles the moderator.